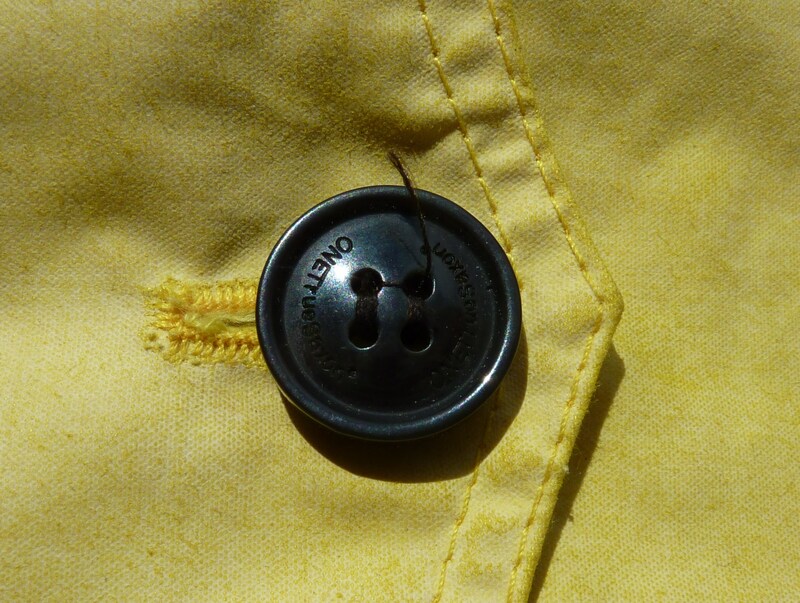 Buttons - pay attention to the details - Well Dressed Dad - It is a proper menswear blog. Like, with original words and opinions and suchlike. I’m sure I’m not alone in taking time to notice the subtleties and details of garments I buy. The first impression invariably takes in a lot less than the full picture, and I’ll keep noticing, and mostly appreciating, the smaller details of the design and construction. And this is good, as if all garments showed their full array of features right away, wouldn’t the whole experience be a lot less interesting? We live in times where the profit margin is the most important aspect of almost everything being done, everything else plays second fiddle. While I’d argue it’s a crying shame that when it comes to production values such as quality and design should be given more attention, or, to just make really proper stuff to put it plain and simply, I’d be up against men in suits with Excel sheets that tell no lies. I’ve heard that in general clothes are being constructed in simpler and more production-friendly ways as time passes. The economies to be found in simpler production are given priority over style and fit. Maybe something to research further for a future piece. Something I’m increasingly noticing are the buttons used on the garments I own, and to be honest, it’s becoming a little obsession of mine. To put it out there right at the outset: I find it incredibly annoying to see how little attention is paid to such a subtle, yet important, detail. I decided to do a little research on this matter, so I emailed one of my friends in the industry to check if my suspicion was correct. And really, it was. Buttons are cheap. Generic plastic buttons bought in quantity cost around 5 pence a piece. Consider this the low point, both in price and design. Horn buttons come in at around 50 pence a piece. A whopping 10 times as expensive! I’m sure that is a compelling fact for the bean counters and cost cutters, but consider it another way. 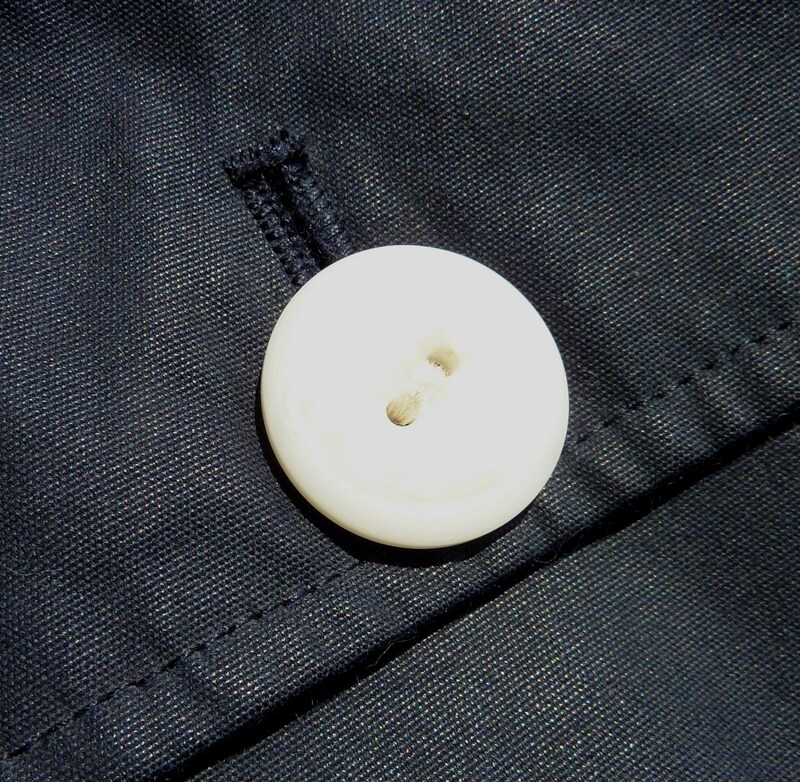 50 pence times 6 comes to 3 pounds for enough buttons to outfit an average jacket. 3 pounds for a jacket that may retail for 300 pounds. Yes, it will mean less profit margin, but the person looking at the jacket will notice and appreciate the difference. With all the dross produced these days, buttons is one of the ways in which to differentiate and signal a commitment to quality. Somewhere in the middle are custom made buttons. Of course, usually made in plastic, and even engraved with a company name they will be pretty cheap when ordered in quantity. I’ll not say they’re as good as horn buttons, but they’re a step up from the really nasty generic stuff. It’s all about paying attention to the details as well as the bigger picture. Oddly, whilst on cheap pieces you’re almost certain to find the cheapest and nastiest buttons around, the opposite isn’t necessarily true for expensive pieces. 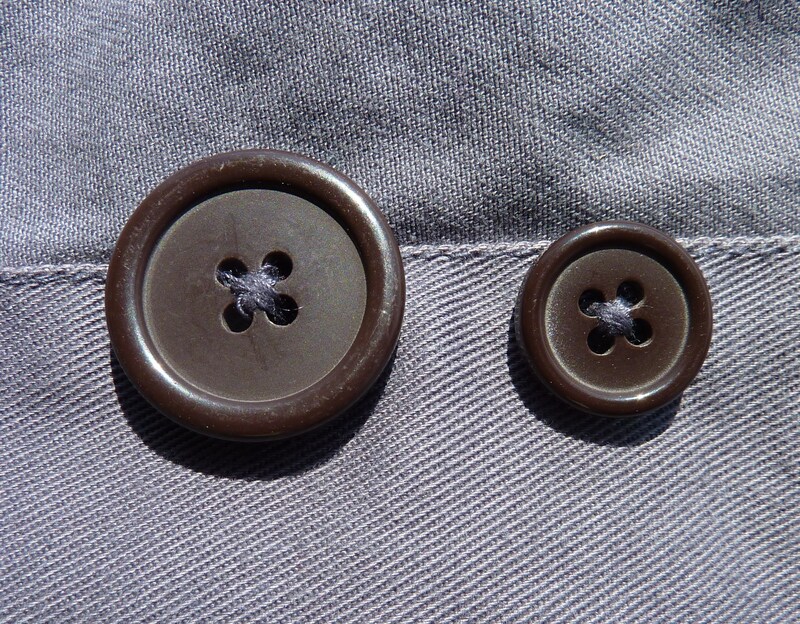 Whilst in general high-end makers will make an effort to use buttons of appropriate quality, you’ll quite often see that they’ve gone for saving some pennies instead. Use this as an indicator of how much effort they might have put into other aspects of the garment and see if you’re still enamoured with it. If there is one downside with regards to horn buttons it is that they can be a bit weaker than plastic. This is of course due to natural materials being involved, and quality control on a cow growing a horn is necessarily less than a chemist mixing up a new batch of plastics. Due to this, the next point is important! It’s good form to provide a spare buttons with the garment. One of each type used, at the very least, so you can replace the ones you’ll lose when the poor factory stitching comes undone. Normally you’ll find them sewn on the inside of the garment, but sometimes they’ll come in a little packet. In the latter case, put them safely in your Button Box, which all proper gents have. Keep the Button Box next to your Label Box. If these terms come as a total surprise to you, look out for next weeks posts explaining these remarkable boxes in excruciating detail. Here’s another one I found really shameful when I noticed it. A waistcoat by NN07, from their limited edition “Directors Cut – Personal Closet” collection. This signifies it’s a somewhat special piece, and in proper Harris Tweed and a cut that is very close to Nigel Cabourn’s Mallory waistcoat, it has the potential to be really nice. So what buttons did they use? Well, they’re what we’d call “shabby chic”, I guess. They look worn, but they’re all identically “worn”. And once you notice that it becomes the singular feature of the waistcoat. Pitiful. This waistcoat will in due course turn up in Waistcoat Wednesday, where it’s good points will also feature! This one is on a jacket I have by Suit. Not as bad as it could have been, but… It’s so plain! And another jacket button, this one by One True Saxon. Plastic, but at least it’s not from the standard selection, being stamped with the brand name. 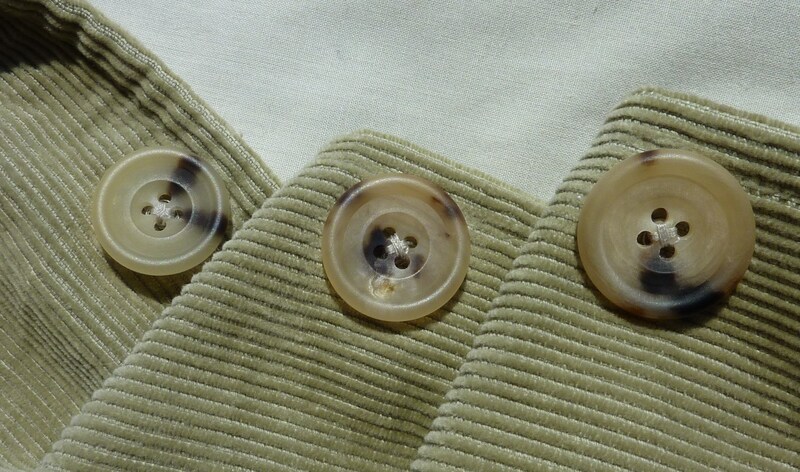 Lovely horn buttons on this SEH Kelly Tour jacket. 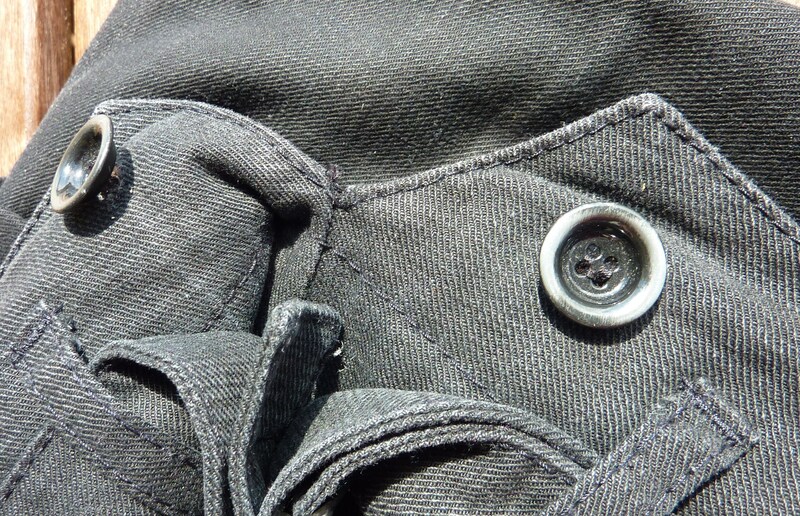 Proper metal buttons for wearing braces on these Otto trousers by Hansen Garments. 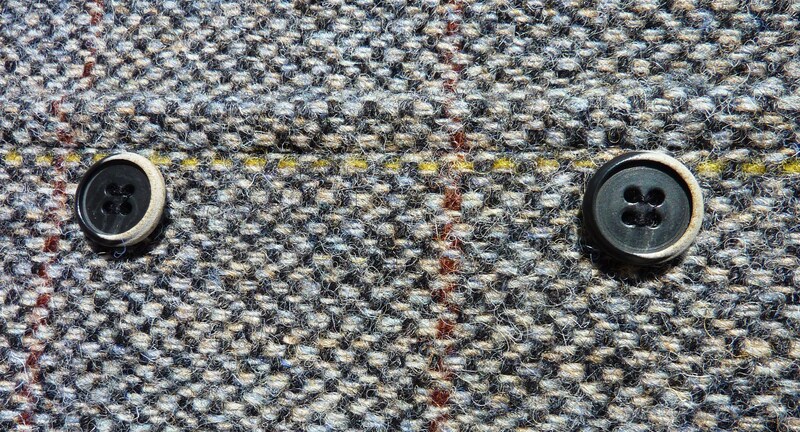 Lovely horn buttons in hues that match the Harris Tweed on this Nigel Cabourn Crazy Mallory jacket.